Vic Law dunks during the first half of Monday's game against American. 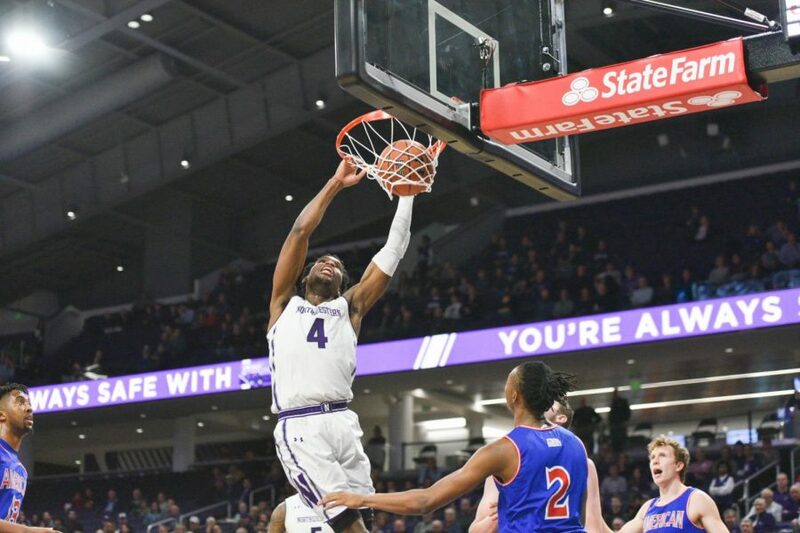 The brand-new Welsh-Ryan Arena was half empty and Northwestern played at times just as sleepily, shooting a mere 36 percent from the field, but solid performances from two key senior leaders carried the hosts to victory nonetheless. Senior forward Vic Law tallied 26 points, tied for second-most in his long college career, and senior center Dererk Pardon pulled down 18 rebounds, easily the second-most of his career, as the Wildcats (2-0) slipped past American in an ugly 63-51 victory Monday night. NU trailed throughout much of a foul-laden first half while the visiting Eagles (1-1) benefited from some fortunate bounces, yet a strong closing stretch gave the Cats a 38-31 edge at the break. But the team’s shooting woes worsened even further in the second half, with only three of their first 18 shot attempts in the frame falling, and American rallied back to tie the game with 11 minutes left. After a long scoring drought, however, a 13-2 run knocked the upset risk out of DEFCON 1 level and NU played with a comfortable lead for the closing minutes. The team ultimately conceded only 20 points in the second half — another impressive defensive showing on the heels of last Thursday’s 82-52 season-opening win over New Orleans. Law and sophomore guard Anthony Gaines closely followed shifty American guard Sa’eed Nelson throughout the night and held the Patriot League Preseason Player of the Year to just 10 points on 3-of-14 shooting. Center Mark Gasperini led the Eagles with 17 points, but the team collectively found little space to operate in the Cats’ end. On the other side of the box score, Pardon and graduate guard Ryan Taylor both got to double digits after a high number of shots — 5-for-14 for 13 points for Pardon and 3-for-9 for 10 points for Taylor — and true freshman guard Ryan Greer scored his first career points in a surprisingly plentiful 24 minutes. Nevertheless, it was Law who dominated the night, going 9-for-19 from the floor in addition to six rebounds. Collins said he was most proud of the team for not letting their offensive struggles affect its psyche and lead to mistakes on the defensive end, and Law added that he felt the defense was “clicking” right now. With one more lesser-conference opponent coming into Evanston — Binghamton on Friday — before NU heads to the Wooden Legacy tournament in California next week, the coach emphasized a big-picture outlook when assessing Monday’s pedestrian performance.